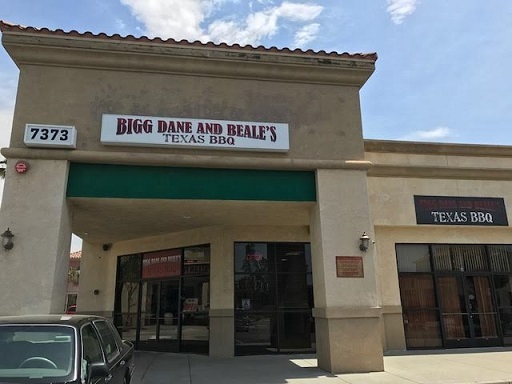 I read about Bigg Dane’s in late 2015 but only recently sought it out, after 1) remembering and then 2) learning it’s on the near side of Fontana, off the 15 at Base Line Road, a stone’s throw from Rancho, rather than a few further miles out of the way. Actually getting to Bigg’s from the freeway is tricky due to the layout of the intersection, but a couple of counter-intuitive left turns and I was in the shopping center. There’s a smoker out front, a good sign; inside, you order at the counter and take a seat in the adjacent dining room. The menu has plates with two sides, sandwiches with one side and a few lunch specials. My first visit, I ordered brisket with collard greens and cornbread ($15). 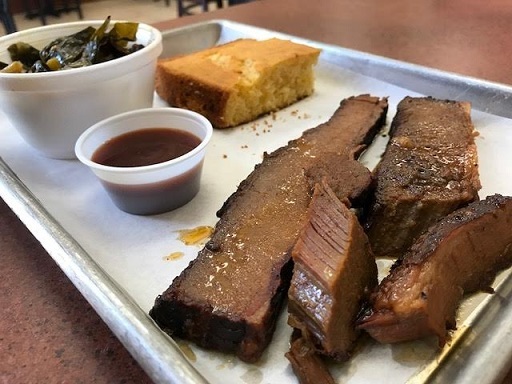 My food was delivered on a metal tray lined with paper: two long strips of brisket, sauce on the side, a plate of cornbread and a dish of greens. It was all good. 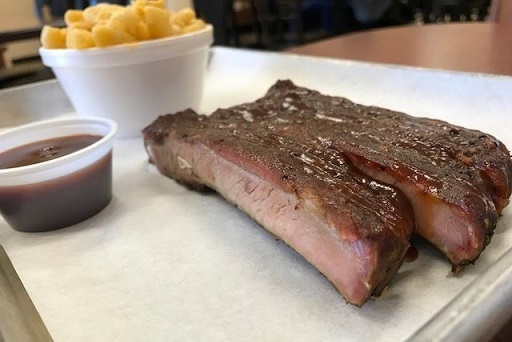 Wanting to try the ribs, I returned the next week for the three-rib lunch special ($10) with one side, mac and cheese. The mac was dense and cheesy. As soon as I picked up the first rib, its heft, density and smell let me know these were serious. The meat was tender but firm and came off the bone cleanly; the taste was excellent. I am no barbecue expert, but I’ve eaten at Franklin’s in Austin, Pappy’s in St. Louis and Bludso’s in L.A., and while Biggs’ weren’t at that level, nor would I expect them to be, they were reminiscent of that level. The ribs have a dry rub and don’t need sauce, and yet the thin, slightly sweet sauce on the side was quite good too. The dining room is clean and new, a little sterile due to minimal decor. 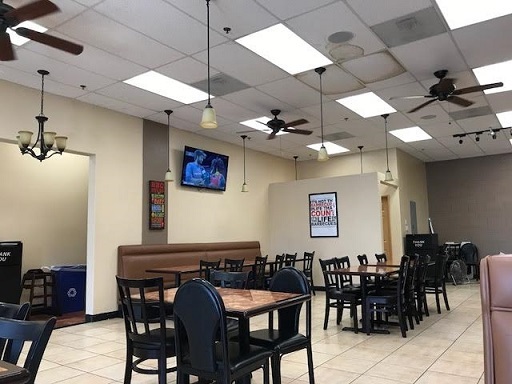 I was surprised how unoccupied it was given the quality of the food. Maybe it’s busier on the weekend. Owned by two longtime friends, it’s a family-run operation, and on one visit a young daughter was stationed at a table, coloring. Gotta like a place like that. 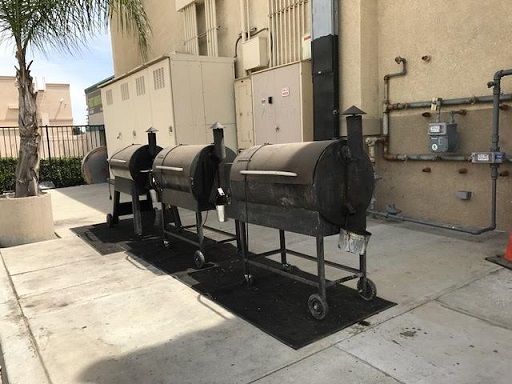 This entry was posted in Restaurants: Fontana and tagged bbq, Fontana, restaurants by David Allen. Bookmark the permalink. Just came from a delicious lunch with my niece at Bigg Dane and Beale’s. I had the (very meaty!) ribs, collard greens and potato salad; she had the brisket, greens and mac and cheese; and we shared some cornbread. We both liked our meals a lot, and I especially loved the greens! Thanks for the review! You’re welcome! Glad someone followed my tip — and liked the results.